Left to right: Nina Curtis, Stacey Jackson, Sally Fitzgibbons and Katie Pellew-Spithill on Sydney Harbour. Australian wild card entry 33 South Racing are sitting in ninth place as we go to publication this week in the 2015 Extreme Sailing Series™ championship after missing Day Two due to a crash on the first day. “We want more days to race! We can see the improvements and we are really excited for tomorrow – we are after our first podium. We love the home crowd. It is so cool to hear them cheering as on,” commented Aussie skipper Katie Spithill. Australian wild card 33 South Racing, were T-boned on the startline of race three by Lino Sonego Team Italia on Day One. Despite the gaping hole in the back of her boat, skipper Katie Spithill heroically finished the race in a respectable fifth place, before limping back to the dock for overnight repairs. The damage was bad enough to put 33 South Racing out of the rest of Day One and only return to the water in time for the race organiser to end racing for the day as there was too much wind for safe racing on Day Two. The crew praised the shore team working through the night and all day to get it fixed. With only weeks of training the team hit the water for the first day of racing with a good start to their regatta, placing 9th, 7th then 5th before the crash. The final of the Extreme Sailing Series™ Act 8, Sydney when not only the Act winner but the 2015 Series champion will be crowned, takes place today, Sunday December 13th. 1st The Wave, Muscat (OMA) Leigh McMillan, Sarah Ayton, Pete Greenhalgh, Ed Smyth, Nasser Al Mashari 147 points. 2nd SAP Extreme Sailing Team (DEN) Jes Gram-Hansen, Rasmus Køstner, Thierry Douillard, Mads Emil Stephensen, Brad Farrand 144 points. 3rd Red Bull Sailing Team (AUT) Roman Hagara, Hans-Peter Steinacher, Lionel Vaucher, Shaun Mason, Stewart Dodson 131 points. 4th Oman Air (OMA) Stevie Morrison, Nic Asher, Ted Hackney, Ed Powys, Ali Al Balashi 126 points. 5th Team Turx (TUR) Mitch Booth, Edhem Dirvana, Selim Kakis, Diogo Cayolla, Pedro Andrade 123 points. 6th Lino Sonego Team Italia (ITA) Enrico Zennaro, Pierre Pennec, Nevio Sabadin, Stefano Rizzi,Tom Buggy 87 points. 7th Gazprom Team Russia (RUS) Igor Lisovenko, Pavel Kalinichev, Pavel Karachi, Alexander Bozhko, Aleksey Kulakov 87 points. 8th GAC Pindar (GBR) Adam Minoprio, Seve Jarvin, Jeremy Lomas, James Wierzbowski, Tyson Lamond 75 points. 9th 33 South Racing (AUS) Katie Spithill, Matthew Chew, Stacey Jackson, Henry Kernot, Luke Payne 71 points. British multihull racer Leigh McMillan was officially crowned the most successful skipper in the nine-year history of the Extreme Sailing Series™ in Sydney today when he clinched an unprecedented third championship title. McMillan and his crew on The Wave, Muscat completed his hat-trick in superb style with yet another convincing Act win on a breezy Sydney Harbour and against the stunning backdrop of the Sydney Opera House in front of thousands of spectators who lined the waterfront. The key to The Wave, Muscat’s success not only lies in McMillan’s experience on the helm but in the consistent performance of his outstanding crew. These include British double Olympic gold medallist and current ISAF World Sailor of the Year Sarah Ayton, America’s Cup sailors Pete Greenhalgh and Ed Smyth and Omani sailor Nasser Al Mashari. With the Act and 2015 Series crown decided by mid-afternoon, the battle raged for the remaining podium positions. Second-placed SAP Extreme Sailing Team almost lost it all to Red Bull Sailing Team in the closing moments of the final, double-points race, after a collision with Gazprom Team Russia disabled the Danish team’s steering system knocking them out of the race. Having worked hard all week, their second place in Sydney - and more importantly the coveted runner’s-up spot on the 2015 Series leaderboard – was at stake. The Danish co-skippers Rasmus Kostner and Jes Gram Hansen could do nothing but watch as Red Bull Sailing Team raced on, taking as many valuable points as possible from the Danes. However, despite a gallant effort from Red Bull Sailing Team, third place in the final race just wasn’t enough for helm Roman Hagara to bridge the points gap and the Austrian team finish in Sydney and the 2015 Series podium in third. Sydney Harbour produced superb conditions for racing this week and today was no exception, with a number of near-misses and with GAC Pindar, Lino Sonego Team Italia and Oman Air all coming close to capsizing, much to the delight of the crowds watching from Mrs Macquaries Point. 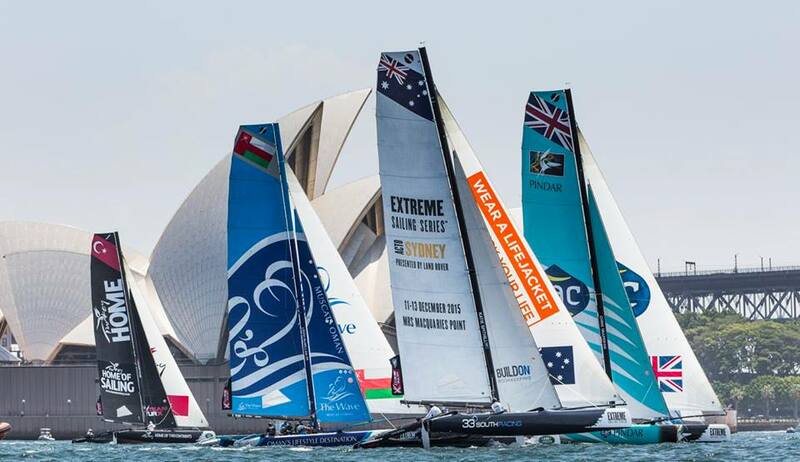 Leading the chasing pack in Sydney, Oman Air, Team Turx and Gazprom Team Russia finished the Act in fourth, fifth and sixth respectively. But perhaps the biggest cheers of the week went to the final three boats, Lino Sonego Team Italia, GAC Pindar and Australian wild card team 33 South Racing, as they hurtled around the racetrack. 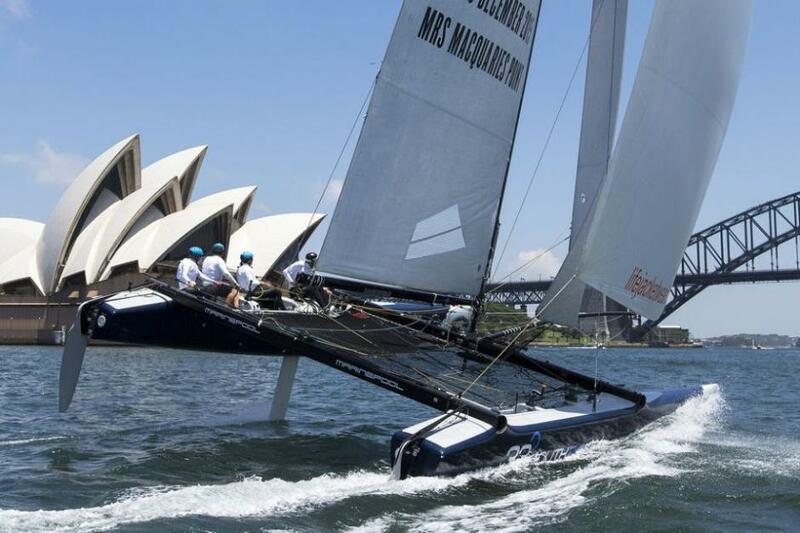 The Sydney Act and the end of the 2015 season sees the Extreme Sailing Series bid a fond farewell to the Extreme 40 catamarans as Series originators and organisers OC Sport usher in a new era with the GC32 hydro-foiling catamaran as the weapon of choice from the start of 2016. Over the last nine years the Series has seen millions of spectators and thousands of VIP guests watch the racing from the shore. In 2016 the Extreme Sailing Series is set to continue to break new ground and innovate as it brings cutting edge foiling boats into its unique city-centre Stadium Racing settings. 1st The Wave, Muscat (OMA) 87 points. 2nd SAP Extreme Sailing Team (DEN) 74 points. 3rd Red Bull Sailing Team (AUT) 70 points. 4th Oman Air (OMA) 58 points. 5th Gazprom Team Russia (RUS) 51 points. 6th Team Turx (TUR) 44 points. 7th GAC Pindar (GBR) 43 points. 8th Lino Sonego Team Italia (ITA) 42 points. 1st The Wave, Muscat (OMA) Leigh McMillan, Sarah Ayton, Pete Greenhalgh, Ed Smyth, Nasser Al Mashari 213 points. 2nd SAP Extreme Sailing Team (DEN) Jes Gram-Hansen, Rasmus Køstner, Thierry Douillard, Mads Emil Stephensen, Brad Farrand 198 points. 3rd Red Bull Sailing Team (AUT) Roman Hagara, Hans-Peter Steinacher, Lionel Vaucher, Shaun Mason, Stewart Dodson 196 points. 4th Oman Air (OMA) Stevie Morrison, Nic Asher, Ted Hackney, Ed Powys, Ali Al Balashi 174 points. 5th Team Turx (TUR) Mitch Booth, Edhem Dirvana, Selim Kakis, Diogo Cayolla, Pedro Andrade 160 points. 6th Gazprom Team Russia (RUS) Igor Lisovenko, Pavel Kalinichev, Pavel Karachi, Alexander Bozhko, Aleksey Kulakov 143 points. 7th Lino Sonego Team Italia (ITA) Enrico Zennaro, Pierre Pennec, Nevio Sabadin, Stefano Rizzi,Tom Buggy 125 points. 8th GAC Pindar (GBR) Adam Minoprio, Seve Jarvin, Jeremy Lomas, James Wierzbowski, Tyson Lamond 122 points. 9th 33 South Racing (AUS) Katie Spithill, Matthew Chew, Stacey Jackson, Henry Kernot, Luke Payne 97 points. 33 south racing day 4 - picture by Lloyd Images. 33 south racing day 1 - picture by Lloyd Images.